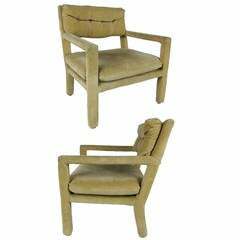 Beautifully restored pair of walnut armchairs with grey velvet seat cushions by Kipp Stewart. The frames have been freshly refinished and the cushions are newly upholstered in luxurious heavyweight grey cotton velvet. Freshly refinished, new upholstery webbing, freshly upholstered seat cushions. 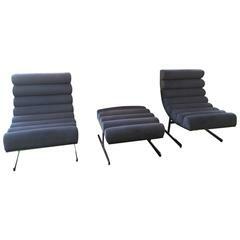 Pair of Classic Open-Arm Lounge Chairs with loose cushion seat and back by Milo Baughman for Directional. 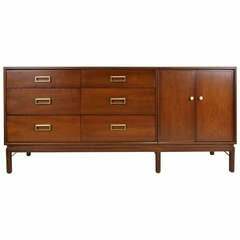 Rare &quot;Sun Coast&quot; Dresser by Kipp Stewart for Drexel. The Walnut cabinet is raised on a brass stretchered base and has pullouts as well as drawers with brass pulls. 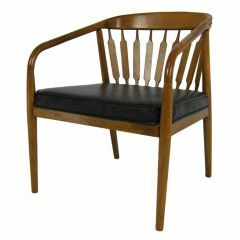 A pair of Classic tub chairs by Kipp Stewart for Directional. Very comfortable with a great look. Original casters. 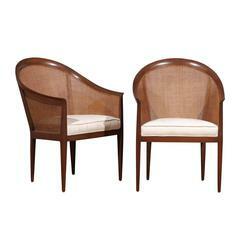 Very elegant cane armchairs by Kipp Stewart. 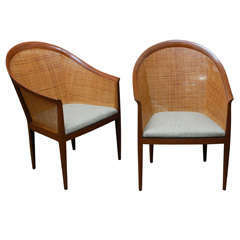 Pair of "Arc" lounge chairs by Kipp Stewart for directional. 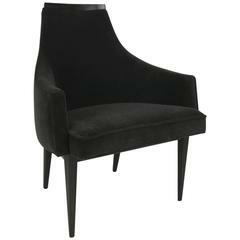 The chairs have the original suede fabric with a polished steel frame. 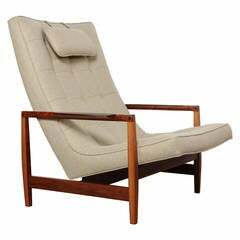 A large-scale lounge chair with walnut and rosewood frame and exposed joinery. Designed by Kipp Stewart for directional. 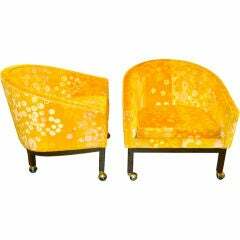 Beautiful channel design upholstery. 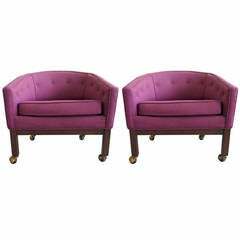 Ottoman dimensions: 16 height x 25 wide x 25 deep.